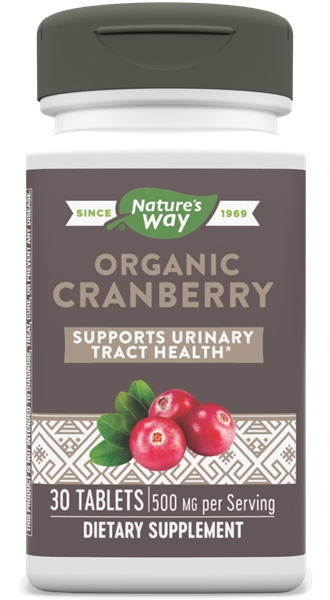 True Organics® Cranberry / 30 tabs - Nature's Way®. Why take True Organics® Cranberry? Look for the seal on any label of an organic product, any product. If you see the USDA organic seal, you know it's real! But don't stop there. True Organics Cranberry is manufactured in a facility that has been certified by Quality Assurance International - a USDA accredited certifying agency. Take 1 tablet daily. If pregnant, nursing, or taking any medications, consult a healthcare professional before use. What does the term 'organic' mean? According to the United States Department of Agriculture (USDA), the term organic means that the food or ingredient is produced by farmers who emphasize the use of renewable resources and the conservation of soil and water to enhance environmental quality for future generations. Animals are raised without antibiotics or growth hormones; plants are grown without most conventional pesticides, fertilizers with synthetic ingredients or sewage sludge, bioengineering, or ionizing radiation. Producers and manufacturers of organic products must be certified by a government-approved certifying agency. Are all products labeled as organic the same? No, there are important labeling differences among organic products. A product can list any organic ingredient on its label as long as the ingredient meets the United States Department of Agriculture (USDA) organic definition. In order to label a product “organic,” the formula must contain at least 95% organic ingredients. In addition, only products that are at least 95% organic can use the USDA organic seal on the package. This is a quick way for customers to check that they are getting an organic product.